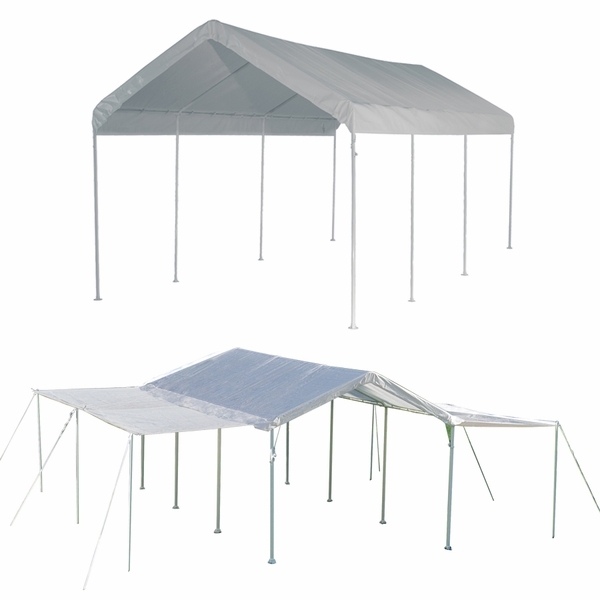 This canopy sets up quickly and can be used by itself or with the extension kits that convert the 10' x 20' canopy into a 20' x 24' expanded event tent. The frame is made of 1/38" diameter steel tubing and is field tested to withstand all but the most challenging weather. The frame is finished with the 13 step Rhino Shield preparation process and has a Dupont(tm) thermoset baked on powder-coated finish to prevent rust, weathering, chipping, or peeling. The Twist Tite(tm) technology and the Easy-Slide Cross Rail(tm) system secure the canopy to the frame and locks down the shelter. Other features include wide secure foot pads on the poles, and a rip-stop polyethylene cover that is 100% waterproof as well as resistant to fading and fungus. The extension kit includes the two side walls and six extra poles, ropes, and anchors. I lost the directions to put together my ShelterLogic 10 x 20 Max AP 8 Leg Canopy Shelter. Is there any way you could email me the directions? Does the water run off of the extension kit? I'd hate to buy it and have it collapse. I use it to set up for Halloween decorations that can't get wet. If water does collect, will it hold the water weight? The water will run off in moderate rain conditions. However, there is no guarantee that the extensions will not collapse during heavy rains. How many different colors does in come in ? This item only comes in white. As far as I know it only comes in white! Does the canopy kit also come with end enclosures? The enclosure kits are available as a separately purchased accessory. You can find them here and here. Is the cover of the ShelterLogic 10 x 20 Max AP 8 Leg Canopy Shelter with Extension Kit - 23530 fire rated to CPAI-84 compliance? Yes, this unit does carry the CPAI-84 fire rating. Can the 'extensions' be installed as walls? Yes, they can but they do not attached at the bottom. We lost our assembly instructions. Can you send us a new set? They can actually be found on the item description tab. You will see "Download Product Manual" towards the bottom of the section, under "Related Articles & Product Manual." Can I purchase just the two 7 x 20 extensions withe poles? Yes. Those are right in the accessories tab on the item page. You can also find a direct link to them right here. What is the difference between the 23530 model and the 23532 model? The 23532 also has an enclosure and the 23530 does not. What is the weight of the Shelter Logic 10 x 20 Max AP 8 Leg Canopy Shelter with Extension Kit? The ship weight of this item is 117 pounds. Is this the basic cost of a replacement canopy for a 10 x 20 frame car cover? Is the screen kit compatible with the extension kit? Can they be purchased as a package? The screen kit is made for the canopy only. There is not an additional screen kit for the extension. At this time, the screen kit and canopy are offered separately only. The screen kit and the extension kit can be used simultaneously. Was satisfied with our purchase and the canopy did the job. ConsThe only question really is that when we added the attachment sides, there were 13 holes and only 12 holes on the actual main canopy, so it created an overlap. As advertised. It arrived ahead of schedule. It assembled easily and is working great. I added additional weighted tie downs at the corners and the tent stayed put under gusts of 50 mph. Like it, but . . . I have owned my 2 in 1 Canopy Shelter for about a year now. In my haste I ordered the wrong one, wanted a 3 in 1. Since I needed to use it shortly after getting it, I accepted my fate. I failed to fill out the warranty information and that has proven to be a mistake. This is a review is a reflection of the product. My lesson to share, inspect your product, sign up for the warranty, address issues ASAP. Though I have utilized this canopy several times in the last year, it wasn't until a few months ago that it was pointed out to me that 3 of my connectors WERE WELDED WRONG. I thought that they somehow got bent in transport. This made set up frustrating. The misalignment of the form compromised the canopy's integrity and thus, it would come apart often - this is not good when it is the roof and it is raining and windy. Though I find the offerings of this company interesting, I haven't decided if I wish to do business with them again or recommend them. I am having to deal directly with ShelterLogic to order replacement parts and the end enclosure kit I originally needed. Lets be honest, ShelterLogic is the company that manufactured this product, not eCanopy. I can not say that it is eCanopy's fault for the quality of the product I purchased. ProsWhen secured, this is a spacious canopy. There is quite a bit of configuration options with the extension format. I have used it with both side walls down, one wall up, both walls up. Free shipping from eCanopy was greatly appreciated. Conspoorly manufactured pieces make set up difficult. Poor configuration, due to poorly manufactured pieces, make for uncertain stability during use. I feel like the quality of this is product is very poor considering the amount of money I paid for it. I wouldn't trust this to hold up under any kind of poor weather. I wouldn't have minded if it had cost less because I feel like you should get what you pay for but I was looking for a quality, long lasting canopy and this isn't it. The pipes are too small and the material of the canopy is too thin. This is fine for a non permanent shade source on a calm sunny day but that's all I would feel comfortable using it for. assembly went well, poles could have better markings but atogether construction seems to good. Easy to put up and take down, well marked parts - held up really well in a major rain storm. The only complaint I would have is the quality of the rope provided - need to buy better rope for the extensions, otherwise it's all good. I'm very pleased with the value.